I consider you and Khun Dow a great resource, doing good work that people need. I appreciate it, and I'm sure that goes for many, many more people. Ok no worries thx for catching it! Very important we get this. My sister has recently had her first big flare of autoimmune disease. Was hospitalized, almost out of work, etc. I sent her my last remaining tablet and in only one week at 3mg she says I saved her and she feels like her old self again. So we really really appreciate that you are dedicated enough to make this available for us all! I know it can't be easy but you are doing very important work! I've never felt any different in taking it over 7 years.. But I had immediate results with it stopping severe hives I had for 8 years..I was having outbreaks 3 times a week. Plus I've had no colds either.. This is not a feel good Rx. One needs the right nutritional food and sleep to help build the immune system. 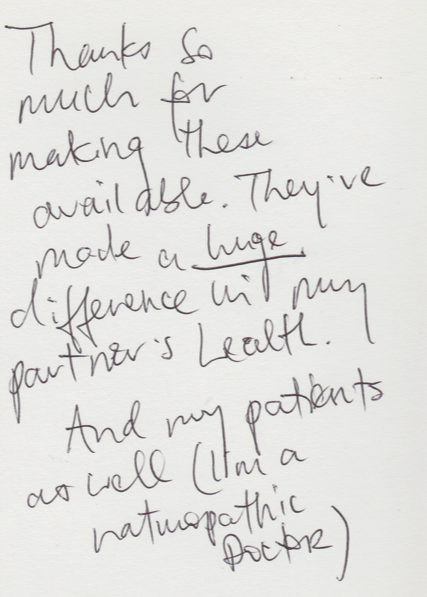 LDN has been such a game changer for my partner, as well as my patients. I so appreciate that you are dospensing these, because I have yet to find a doctor here who will! Ian, I will reorder because it has made a world of difference for me, and I have referred others to you because I was very cautious and skeptical to begin with and I trust your product. And you are a great resource for information. I just wish we didn’t have so much interference from the outside. It makes me sad that addictive drugs and drugs with horrendous potential side effects are prescribed regularly and sanctioned by the FDA, and benign and equally beneficial drugs generate witch hunts. Big pharma at it’s finest is killing a lot of people. Thank you for doing what you do. pricing for this as it beats getting it here with my lousy insurance! Since renewing my Real Estate Brokers License and joining the local Association.. I've had to take courses from the.. and brought up LDN and my Health Tip Checklist a few times. These people, like most city people are very shallow.. If they their MD or TV don't tell them.. they know nothing about anything else. One female instructor had sinus issues.. and looked bad.. felt bad.. and was embarrassed.. She admitted nothing had helped her. So, I told her about LDN.. and emailed her the info..
2-3 months pass and I see her again this week.. She is beaming.. all excited.. The lady's MD knew nothing about it.. but her Fibromyalgia MD did. Both got great results.. and are happy, happy. "Telling people about LDN is the best way to Win Friends and Influence People!" ... You can Quote me.. ???? The 2 spots of persistent skin cancers on one shoulder.. and 3 on another have been there for some months.. even using Black Salve 3 times.. ... Medical Marijuana and LDN. It has been frustrating..
Also I had a blood clot 2 years ago.. and ended up with some small scabby sores on my shin.. . one gradually grew.. and I applied Black Salve 3 times.. ... Medical Marijuana and LDN. The thing seemed to keep getting larger slightly.. and the hole would not heal.. I could see the bone or ligament under it.. The first couple of time the Black Salve stung a bit.. but the 3ed time it light my leg up in fire immediately.. there has always been some inflammation around it.. but this time it got really inflamed from my ankle to about 5" below my knee.. Seemed to be a blood vein running up there.. I was in pain for a week.. I had had 3 MDs look at it.. scanned the veins.. even.. and they had no clue what to do.. Well, heck.. I can have anyone look at it.. What is with these clowns. Last Friday.. I had Prolotherapy/Ozone Therapy injections.. into my hips from the auto accident.. and into my left bottom foot.. which I've had issues for about 3 years.. finally decided to attack it.. and solve this issue. The injections stung some.. but nothing major.. Lots of pain relief the next day.. Yahoo! The Far East Indian MD saw the inflammation.. which is much less by oh.. 70% than it was.. but still a bad sore.. So she gave me an antibiotic..
Cephalexin 500mg 4x/day and said to eat lots of yogurt for Probiotics. In 2 days almost all the inflammation & 3 shin sores decreased.. The bad sore has closed up to. But the interesting thing is the skin cancer spots on my shoulders also have really healed up... about 85-100%.. I'm shocked.. So obviously I had some bacteria in those spots.. I have only been taking LDN while on this Rx Med too. So thought this might indicate those with slow response ot LDN for Cancer.. might consider adding this antibiotic? PS: I now see why the Yogurt is so important too. My bowels really shut down.. and even taking "Essential Enzymes" daily too. Other than MAYBE some precancerous spots still on my scalp.. I can not really see that to tell.. all my 35+ skin cancers I fought over the last year are gone! GONE! There are only a couple of spots one can see where the skin looks damaged.. due to deeper problem. There is redness there, but seems to fade gradually. Thanks for all your assistance buddy. Did you know what a life saver you are? Have I mentioned how much LDN has helped me lately? Besides being a cancer survivor, in which LDN is probably a great preventive measure against reoccurrence, it has done wonders for my severe inflammatory arthritis. Psoriatic Arthritis is an autoimmune disease. It was so bad, prior to LDN, I was crippled. My knee was swollen and very painful. My hand joints were useless. Now,... it's like I'm not arthritic at all. I can actually play some hoops again. Of course, my COPD kinda hampers my ability on the court, but at this point, I'm amazed I can even put on my sneakers again! So much so that I went out and bought a basketball and plan to open up my lungs, while teaching the kids how the game is played. I wouldn't be surprised if LDN is also beneficial for my COPD, although I don't see much in that regard. It's been progressing somewhat. Anyway, just like you to know how LDN has gave me my life back. It is a great thing you are doing by making available this revolutionary and completely safe medication. Want to see the LDN evidence for yourself? I did. Go to a Naturopath or Blood Analyst who does live and dried blood analysis and see your blood prior to going on LDN. I have Graves Disease or Hyperthyroidism, in other words an overactive Thyroid. My live blood analysis showed the Thyroid problem as a pointed end on some of my red blood cells (tadpole). At the time I was doing the peroxide therapy so the rest of my blood looked pretty good other than the thyroid markers. I stopped taking the peroxide, I wanted to give my body a break, and was now taking LDN for the hyperthyroid. My next visit to the Naturopath revealed no thyroid markers so I was able to visibly see that the Naltrexone was working. It is important to note that I see a Physician regularly (3 – 6 months) for my blood work re the thyroid and he did not see any change in their results. My doctor saw no difference in my t3 and t4 but we saw a massive difference in the live blood analysis, the thyroid markers were completely gone! I told my doctor this and he was actually curious about that and said he actually wanted to see a naturopath to see what LDN is all about, much to my surprise. http://ldn.proboards.com/ . I suggest that all those interested in LDN, should probably subscribe to these above..
**It does not work like that. For LOW Dose we take one 500ml bottle of water, put one 50mg tablet into the water. Each night I drink 30mls of water which is my daily dose of 3mg. So I get 500 divided by 30 = 16 doses/days. At usual Dr Bihari dose of 4.5mg (45mls of solution) you get 11 doses etc. In your case, Naltrexone blocks the receptors for drugs and alcohol, so no point using them, coz no effect, right? So the temptation will be "NOT to go off it for a couple days, so you can feel drugs and alcohol again”. So I suggest your local meetings of AA/NA, you can find them at https://na.org/ and http://aa.org/ I have not had a drink for 21 years, and if u ask me, that has a lot more to do with the above than Naltrexone. Plus for alcohol and/or drugs you take 50mg or 100mg, most clients (for immune system) take 4.5mg, so you take ten times more than the numbers above, however it is still the cheapest way for you. Naltrexone can be an “easier softer” way to detox etc. But for long term, only those Programs above have any track record of success. I would use both barrels by taking Naltrexone, and three AA and/or NA meetings a week until clean for a year. It is not “Antabuse”, that makes you sick if u drink any Alcohol. WOW! That brings the course way down. Hopefully it will break my of my love for beer and spirits. As of today I still have only 60, so I will let you know if I receive them. Thanks for all the hassle. I’m sure the next order will go smoother. I am truly greatful that you are able to send me ldn as my dr. Wouldn’t prescribe it to me for my crohns. It has been working for me for a long time now with not a single flare up in over a year. God bless all of you. Thank you Ian! My hope for lessened pain has arrived. Yay! I've read up on it so much, I'm starting with 1.5 mg but at 6 PM to maybe skip the possible temporary insomnia. Wahoo! Maybe I can start living again. Thank you, Ian! Thank you so much! I have just sent the payment via PayPal to ****@gmail.com. You have no idea how you changed my life and my family's life. I have 3 young children that I couldn't even take care of because of my disease. I couldn't even stand up most of the time. Your site was the only site I could find that delivered Naltrexone to Israel. Since I started taking LDN my life has changed and I function like an healthy person. My kids got their father back. So just know that no matter what, at least you saved one person's life. Again, Ian & Francie thank you, you are good people! Thanks Ian. The naltrexone is my savior. Just helps me so much with joint pain. I would be totally lost without it. Thanks again. Arrived - in good order - thanks! but Dudley prefers the NODICT, anyway. I know Sun Pharma is reputable. including a nice 2020 EXP. of 14 days - great job! please realize that when I ask questions. pictures, please pass them back to me. In the mean time, thanks for a great delivery! My LDN arrived this week and I am so great gulf for its arrival. I'm amazed with my bodies response the reduction in pain. I've suffered with fibromyalgia since '88. For years I was functional, but the past 3 years have been so debilitating I had to retire from my nursing job, which I loved every minute of. You are my savior! My Dr is skeptical but agreed I could take it if I found a study that I could participate in which I did, the FM/a study. I'm hoping she will eventually prescribe it for me and others when she further reviews my progress. Unfortunately I was unsuccessful with the ABF in getting back tablets, I was asked to provide a doctors letter. **I will send ten tablets more in an Airmail letter. I have a few enquiries about the Nordicts Tablets i've been taking for a few months. To be precise I have experienced nothing be severe side effects from this tablets. I've had constant severe nausea and vomiting, dizziness and i've been hit with colds, flus and coughs more than I usually get. My reason for taking LDN was to help balance my immune system due to an overactive thyroid condition i'm currently suffering. Not only have I not seen any benefits, its caused me more symptoms than i've ever experienced. I stopped taking LDN over a month ago. My husband was also on 4.5mg of LDN made with the Nordict Tablet you sent in other to boost his immune systems to prevent colds and flus but it did nothing for him either. I have read online that a few people have had troubles with the brand Nordict. Does this have anything to do with the ineffectiveness of the medication or could something else be responsible for our experience? I mix the tablet in an amber glass bottle, one table with 50ml of distilled water. I shake it before I take it each time.